This year, Halloween is extra special for us, with having just released our second children’s book that happens to have a Halloween theme. 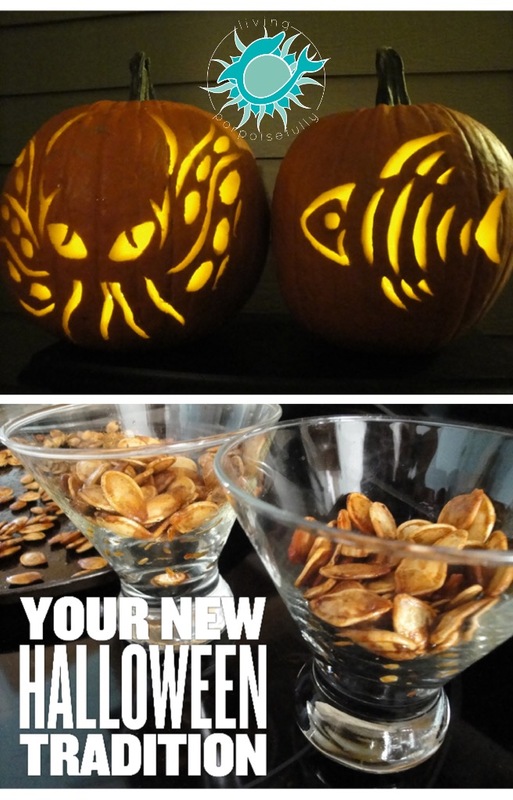 We love sea creatures, and we love Halloween, so getting to combine them is a wish come true. Filled with Halloween-inspired sea creatures like ghost shrimp, goblin sharks, and vampire squid, Shalloween is all lighthearted fun, just like our pumpkin carving tradition! In today’s post, we’ve got the behind-the-scenes into this year’s Shalloween-inspired pumpkin carvings (complete with a printable template!) and our addictive pumpkin seed recipe. Enjoy, and if you’ve got a Halloween tradition, be sure to share in the space for comments! We go about it in the typical pumpkin carving fashion: start with a sketch and then when we’re happy with it, we draw the design onto the pumpkin with a pen. Then it’s time to cut off the top, scoop out the pumpkin seeds and pulp (save it for the seeds! ), and then lay in to cutting out our design with pumpkin carving knives. We hold off on taking the pieces out until we’ve got it all cut — this helps to avoid any narrow pieces from breaking. Once the pieces are out, we do a bit of touch up with the knife if needed. Then we add an LED candle and enjoy the Halloween glow! Now, the tradition isn’t complete without making sea salted pumpkin seeds for a deliciously addictive treat! It starts with sorting out the seeds from the gooey pulp. We remove the larger pieces of pumpkin, but don’t mind if a little bit of pumpkin flavor is left (in other words, we don’t bother rinsing them). Once that’s done, we spread them out on a baking sheet and add a couple of tablespoons of melted butter, depending on how many seeds the pumpkin(s) had. We add about a teaspoon of sea salt and mix it up real good! Next, we pop them into a preheated oven (325 degrees F) and stir occasionally. The baking time can vary quite a bit, so it’s important to keep watch on them after about 10 or 15 minutes. We wait patiently for a nice crispy golden brown. This year’s batch took a little over 20 minutes, but over the years we’ve found the baking time isn’t an exact science. A taste test is a must (hot, be careful!) to see if they need more time in the oven or sea salt. By the way, if your pumpkin seeds spread out over the pan in a single layer, they’ll cook faster too. Stirring occasionally and waiting patiently for that golden brown are the keys! It seems it is officially fall when we’ve completed our pumpkin carving and seed toasting tradition! And with our Halloween children’s book just out, we couldn’t think of a better way to lift our glasses and say “cheers” in celebration. So, if you don’t have a Halloween tradition, give this one a try and it may just turn into an annual event like it has in our house. Have fun!